Dance City is a great place for children. They can take part in a dance class, enjoy one of our great workshops or holiday schools (Easter & summer) and see inspiring dance performances. We encourage visits and participation by children with additional support needs. 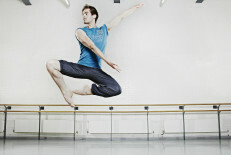 Children and young people can also use Dance City to work towards their Arts Award. Dance City has a 250 seat theatre specially designed for dance where you can see leading national and international dance companies perform live. Every season we have shows especially for children, including an annual Christmas production. Tickets for under 18’s are just £8 for all shows except the Christmas production. Recent shows have included The Little Match Girl, by renowned Choreographer Arthur Pita, the fun and interactive Getting Dressed by Second Hand Dance, and the beautiful Indian folk story: The Magic Fish by ATMA Dance in 2017. Our children’s performances are often accompanied by fun activities or workshops before and after shows, and most of these are free. We have so many different children’s classes to choose from in many different styles of dance including ballet, breakdance, contemporary, hip hop, tap and musical theatre. Dance is a creative, fun and physical activity that is great for boosting self confidence and co-ordination. At Dance City we don’t teach grades or exams and young dancers learn by age group rather than levels. If you want to book a dance class but don’t know where to start why not pick up the phone or pop in to talk to one our friendly dance experts in the Ticket Office? They can guide you through choosing the perfect class for your child and get you booked in. All classes are drop-in so you can join at any point in the term. Classes can be pre-booked so we’d recommend doing this in advance to avoid disappointment on the day. Dancecity.co.uk has lots of detail on each class (more than we can fit in the brochure), the level of experience you do or don’t need and advises on any specific clothing or footwear requirements. When you arrive please pop into the Ticket Office to collect your ticket so your child can hand it to their teacher. Please let your teacher know if your child has any health issues, injuries or additional needs. Please arrive in plenty of time, latecomers may not be admitted as we don’t want your child to miss the warm-up. After your first class you’ll receive a follow-up questionnaire, it’s really helpful for us to know we’re giving you the best experience possible so please complete it. If you’re not sure the class was the right one then don’t despair, please talk to the Ticket Office and they’ll help you find another option. If you’ve found the right class for you then hooray! We hope you’ll see the benefits of joining a class regularly and if you buy 4, 8 or 12 classes in advance you can save upto £1.50 per class. Our end of term performances Shine (March) and Shimmer (July) offer class participants the chance to perform on the Dance City stage and show off their moves to family and friends. If you do want to take your dance to the next level why not audition for the Dance City Youth Company or consider our Centre for Advanced Training? Dance City’s Learning Academy offers formal, professional, dance training at all levels starting from children aged 10. The Dance City Centre for Advanced Training is part of the Department for Education’s Music and Dance Scheme offering a contemporary dance training programme for young people from the North East region who are 10 – 16 years of age. Entry to the CAT is by audition only, and we are looking for young people who demonstrate exceptional talent or potential in contemporary dance.